Age category for 2016: Junior. How many years have you been competing on team GB? : Four. Sponsors: La sportiva, Petzl, Beal, Climbskin, Marmot, Rockcity, Hackney council, GLL. Winning the European youth cup in Mitterdorf, Austria. What’s an average Jim Pope day? How do you fit the training required to climb at this level around the full-time job of going to school? For me, my day is pretty easy because everything is so close in London. It takes me five minutes to get to school from home and then ten minutes from home to the Castle Climbing Centre. 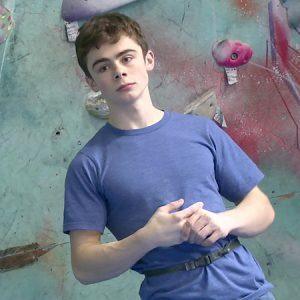 I train four days a week and manage to get all my school work done in-between coming home from school and going climbing. What are your personal three top tips for young climbers wanting to clip the chains on harder routes? Warm up well, know the moves and what you need to do, and really, really want it. There’s no point trying it if you don’t want to do it. Also, it’s strange making the transition from indoors to outdoors. A lot of young climbers are climbing really hard indoors at the moment, but don’t be disappointed if you’re not climbing the same grades outside straight away – it will come!